The year was 1997, the Spice Girls were busy spicing up life, and Leo was king of the world. It was a great time to be alive, and not just if you were a 13-year-old-girl. Because if you were a fan of stainless steel sports watches, it was also the year Patek Philippe introduced the Aquanaut. 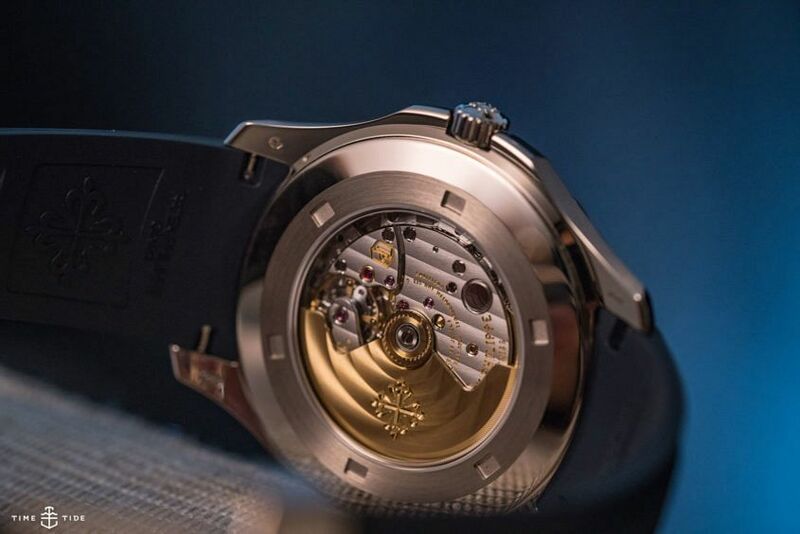 Taking its design cues from the casually elegant Nautilus, it was initially released as a slightly more accessible alternative, and aimed at an active and younger generation of watch lovers. But it quickly stepped out of big brother’s shadow, and has since become an important (if sometimes polarising) pillar of the brand’s sports watches. To celebrate its 20th birthday, Patek have this year released the Aquanaut ref. 5168G. 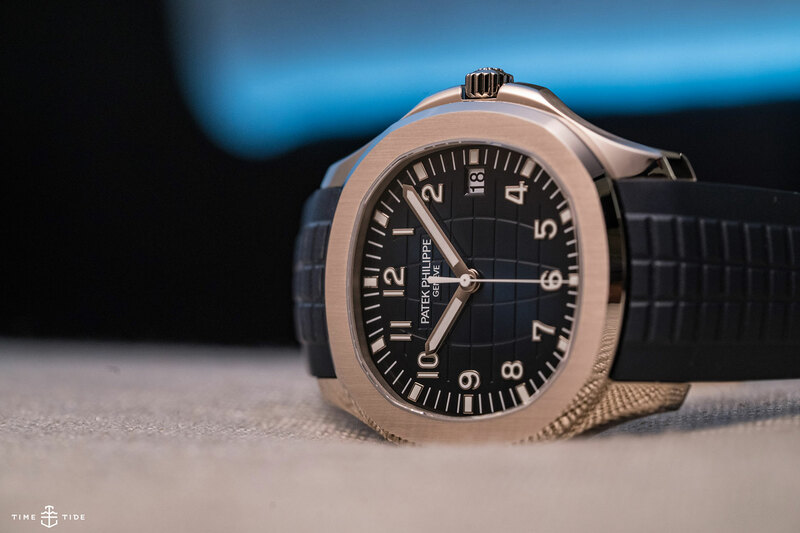 For the first time, the Aquanaut is available in an 18k white gold case, and has been given Jumbo status with its 120m water resistant case upsized from 40mm to 42.2mm. The dimensions may have changed, but the three-part design retains the same lines and curves, and the distinctive rounded octagonal bezel keeps its mix of polished edges and vertical satin-brushed finishing on top. Measuring only 8.25mm thick, it’s also still decidedly slim. Its slender profile is mostly thanks to the use of the same extraordinarily thin movement as we’ve seen before in the Aquanaut. Only 3.3mm high, the mechanically self-winding Caliber 324 S C, uses a heavy central rotor made entirely of 21k gold to top up its 45-hour power reserve, and visible through the sapphire crystal display back, its finishing is absolutely on point. A mix of polished chamfered edges, perlage decoration, and Geneva striping adorn every millimetre, the Patek Philippe seal adorned calibre is rated to an accuracy of -3 to +2 seconds a day. The standout, however, is the finely embossed checkerboard dial, which gradates from a bright blue in the centre to a deep black outer edge. Almost like a spotlight is shining down from above, and setting the ideal backdrop for the applied white gold Arabic numerals, and the now newly applied 18k white gold five-minute markers. In contrast to the dial, these numerals, markers, and the baton-style hands are coated in white SuperLuminova, echoing the sporty nature of the Aquanaut as it straps to the wrist with a dial-matching blue embossed composite strap. 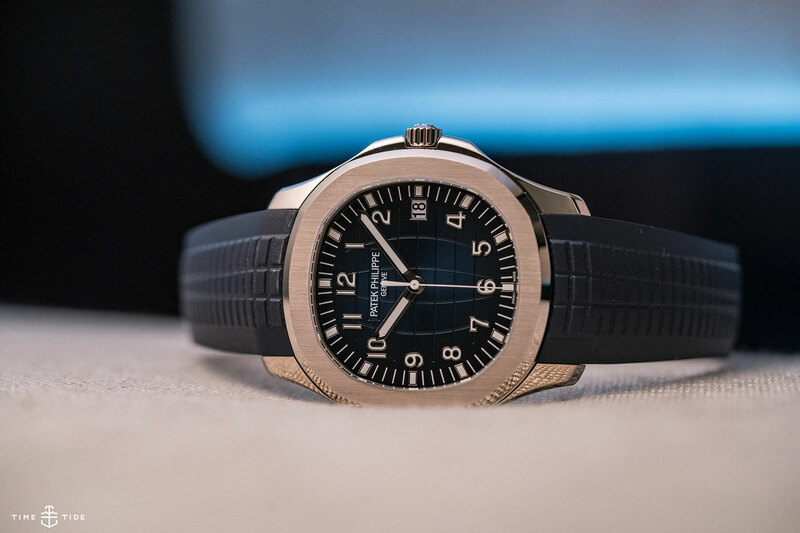 For its 20th anniversary, Patek Philippe have celebrated all that we love about the Aquanaut without distracting from it. 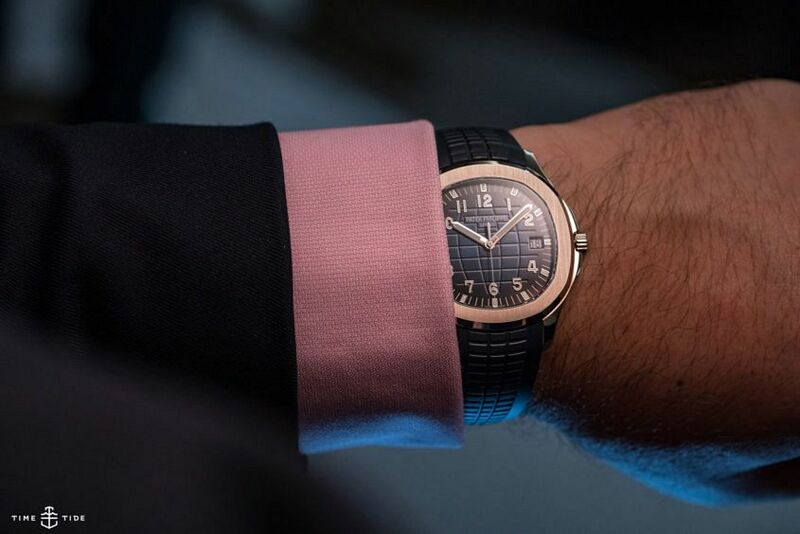 With similar hues to stainless steel, the white gold case adds an extra degree of discreetness to the already stealthy Aquanaut.